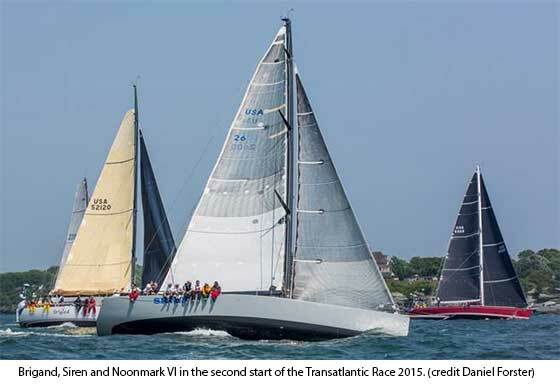 The majority of the 37 boats competing in the Transatlantic Race 2015 launched off the starting line into a brisk southwesterly breeze just after 2 p.m. local time. 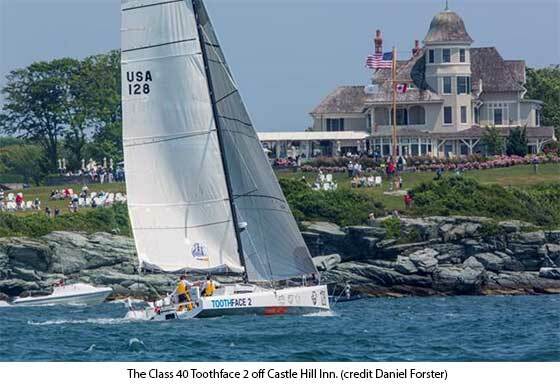 A line of thunderstorms, which had initially been forecast to come through at mid-day, passed over Newport just as the crews of 20 entries were waking to begin final preparations for the second of three starts for the 2,800-mile race from Newport, R.I., to The Lizard off England's southwestern tip. By the time the first cannon sounded at 1:50 p.m., the sun was shining and the breeze was blowing, and the competitors reveled in the ideal conditions. First off the starting line were the five Class 40s, purpose-designed ocean racing yachts that are sailing with between two and four crew onboard, less than half what any other boat in the race is carrying. The Class 40s are the smallest boats in the race but are likely to provide the most intense competition. The boats are very even in speed and are racing in a level class, which means the first boat across the finish line will win class honors. In a video posted earlier today on Facebook, Mike Dreese, the skipper of Toothface 2 and the co-founder and owner of the pop culture retailer Newbury Comics, had this to say about his team's plan for the first 24 hours: "We want to try to race [south] before the winds die out. That's probably the main strategy of most of the fleet, to head south a little more than east in the first 24 hours." Dreese and teammate Rob Windsor have targeted a waypoint approximately 180 miles from the start. The goal is to make it to that waypoint within 24 hours. "That's pretty close to the limit of what these boats can do," he continued. "It's going to be a little touch-and-go as to whether the fleet can make it there before the winds die." The second start was a fleet of 10 boats varying in size from 50 to 100 feet. Sir Geoffrey Mulcahy's Noonmark VI was first across the line, followed closely by Siren, which is being skippered by the father and son team of William Hubbard III and William Hubbard IV. Within 90 minutes of the start, it was the length and power of Clarke Murphy's chartered 100-foot Nomad IV that had taken over the lead of this group, sailing at 14.7 knots on a compass heading of 120 degrees. The news was decidedly less positive for Colin Rath's Persevere, the crew of which includes his 14-year-old daughter Breana and the family cat. "Persevere has suspended racing at 15:01 at 41 degrees 59 north, 71 degrees 12.8 west returning for rig repairs without outside help," Colin Rath emailed from onboard. "Will keep RC updated." At press time the boat was heading back toward Narragansett Bay, though the email indicates they plan to try to fix the problem and re-join the race. The final five boats to cross the line included one boat that is a favorite for overall handicap honors under IRC, the 63-foot Lucky. 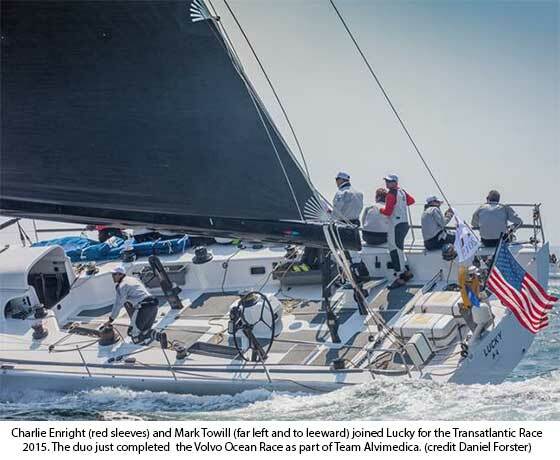 The boat, which is owned by Bryon Ehrhart, has a proven track record in windy races (the original owner was an Australian that raced the boat extensively) and the presence of Charlie Enright and Mark Towill, who raced across the Atlantic two months ago as part of Team Alvimedica's entry in the Volvo Ocean Race, put the odds better in the team's favor. Approximately 90 minutes after the start, Lucky at the head of the IRC 2 pack, was closely trailed by Ron O'Hanley's Privateer and Tilmar Hansen's 52-foot Outsider, from Germany. Shortly after 5 p.m., however, a spokesperson from onboard Privateer called the New York Yacht Club Race Office to say the team was retiring from the race. They were in no danger and did not need assistance. "We have technical problems, and we're not going out there with these technical problems," said the spokesperson. One last start, for the monohulls Comanche and Rambler and the multihulls Phaedo 3 and Paradox, is scheduled for Sunday, July 5, at 2 p.m.